I was feeling rustic... We had fresh meat pierogies from Delightful Pastries (I think I like the potato & cheese ones better, though), sauteed in butter with some shallots and chopped bacon; a pot of navy beans (that seemed to take forEVER to cook... 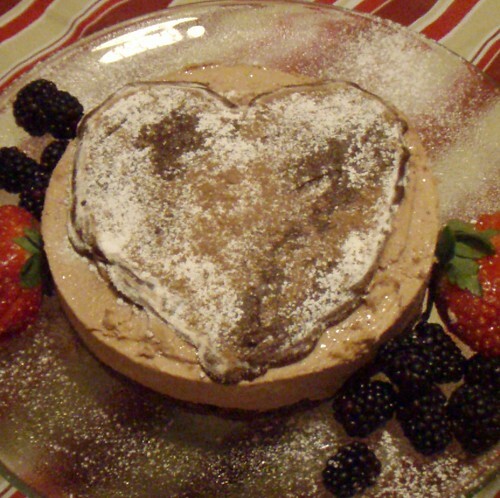 I need to get my hands on a pressure cooker again), with kielbasa, kale, garlic, thyme and a splash of balsamic; cold Zywiec beer; and my husband made creme bruleé from the heart-shaped ramekins of the Rose Levy Berenbaum kit I got him for Christmas a few years back. Happy Valentine's Day - from the gut! 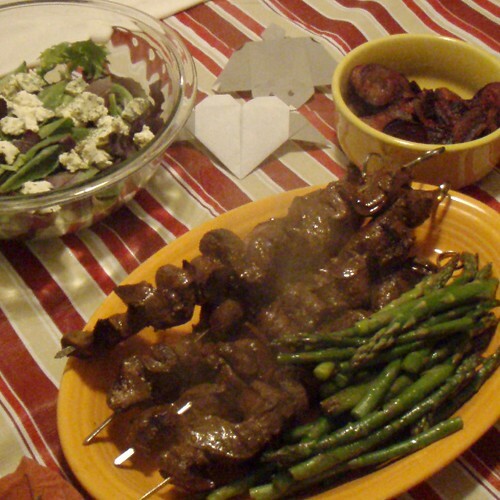 This year's feast: Anticuchos, asparagus, salad, and beet chips, followed by a lovely Nutella Mousse cake. Nothin' says lovin' like well-marinated heart stabbed with skewers and seared on a grill! Mhays wrote: Nothin' says lovin' like well-marinated heart stabbed with skewers and seared on a grill! Nice, looks delicious and made me laugh! I made New Orleans style BBQ Shrimp. Been making the same recipe for decades, modified from a recipe in the first Frugal Gourmet cookbook. Very similar to irisarbor wonderful version she brought to the LTH picnic this year. I made the Frug's New Orleans BBQ Shrimp. His called for margarine, did you substitute butter? Cathy2 wrote: I made the Frug's New Orleans BBQ Shrimp. His called for margarine, did you substitute butter? I've been substituting butter for margarine for years now, but its my understanding margarine is traditional, or at least often used, in New Orleans. This really is a terrific dish, loaf of crusty bread for dunking, few chunks of lemon and plenty of napkins make for a delicious easy to prepare meal. Most LTHers probably have all the ingredients on hand, with the exception of shrimp. Roasted pork loin rubbed with olive oil and Penzey's Northwood's Fire, roasted cauliflower and boiled new potatoes. Everything was simple, yet fantastic. I roasted the cauliflower in big wedges rather than florets and it was wonderfully carmelized. A bottle of Vinum Pinot Noir accompanied dinner. Cheese course was some Carr Valley Mobay with grapes and water crackers. I would have finished it if I didn't have a guilty conscience. That's a damn fine cheese! Dessert were cupcakes from Flourish Bakery. The Chocolate Raspberry narrowly beat out the Red Velvet. A great meal with my honey! Cassoulet, with garlicky sausage from Butcher and Larder, about 20 whole garlic cloves in it, and lots of garlic bread crumbs on top. Nothing says loving like garlic!